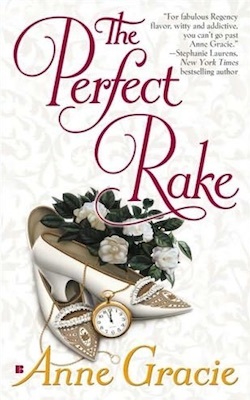 Prudence’s plan to save her beautiful sisters from the brutal guardianship of their grandfather seems foolproof… until she comes up against a charming, devious and utterly irresistible rake. The tall gentleman’s brow quirked skeptically, and she flushed and corrected herself with dignity, recalling that she had probably got him out of his bed. And that she was supposed to be a bored and soignée young lady, quite accustomed to calling on gentlemen. “Oh but—” began the butler. “That will be all, Bartlett,” the tall gentleman said suavely. The mobile mouth twitched a little and the hard expression in his eyes was replaced by an amused gleam. “It was thoughtless of me to come to London, I see. So inconvenient.” He smiled a slow smile, and for a moment it drove all rational thought from her head. The clock struck half past the hour, chiming once in a somber, fatalistic fashion. Prudence jumped. “Oh no—half past nine. Already!” She resumed her pacing. “Yes, a ridiculous hour, I agree.” He yawned. “Oh no,” said Prudence, distractedly. “He is delighted you are here, of course.” She flushed and swallowed and tried to gather her composure. “For . . . for reasons that are rather complicated—but altruistic—I allowed my great Uncle to come to a certain conclusion about you. And me.” She felt her face heat further. 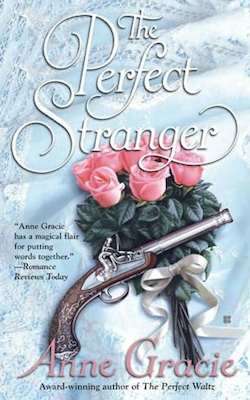 It was not like her to dither, but the situation was truly fantastical, and the way this man’s gaze kept slipping over her was very disconcerting. He flustered her. “No, of course not.” His eyes were dancing now, she noticed. How could he be amused at a time like this! “I imagine he has good reason—” the duke said ironically. “Are you really?” he interjected interestedly. “Am I what?” demanded Prudence, confused. 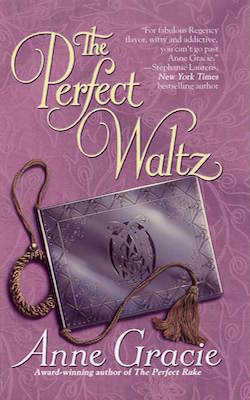 He glanced down at her hand patting his arm soothingly. “Trust you?” His eyes caught hers and held them for a long, long moment, and for a second Prudence felt as if something important had happened. But then he shifted, and his eyes laughed down at her again as if that moment of connection had never been. “Then bring on your dragons, fair maiden,” he said, and lifted his glass to his lips. Prudence scanned his face worriedly. He was very hard to read. For a second there she’d felt so . . . so heartened by that long look, as if she could depend on him in some way. Yet a moment later he seemed to find the whole thing hugely entertaining and was quite unworried by the prospect of Great-uncle Oswald’s imminent arrival. Was that because, as a duke, he thought himself perfectly safe? He found it rather refreshing. He sipped the cognac and made a small wager with himself as to how far she would let the joke go before she confessed all. Of course she might be a blackmailing harpy, but he didn’t think so. He was all too well acquainted with females of that variety. “So, you will defend me from your great-uncle?” he asked softly. It was more than refreshing; it was irresistible, and Gideon couldn’t help himself. Without thinking, he put down his glass, pulled her into his arms, and kissed her. He’d meant it to be a swift, light kiss, something of a thanks with a touch of mischievous provocation, but instead found himself plunged into unexpected depths. She tasted of surprise and sweetness and innocence, but she could not disguise her instinctive response to him. No Quakerishness there, he thought raggedly and took the kiss deeper. “Don’t you dare!” She gave him a haughty little warning glare. He fought the urge to smile. Even her disapproval was appealing. Mastering the urge to kiss her again, he picked up his cognac and sipped. The door was thrown open. Prudence jumped visibly and clutched Gideon’s arm. He was certain she had no idea of it. This was, no doubt, Great-uncle Oswald. In a leisurely manner, Gideon finished his cognac, well aware that the elderly man was snorting and snuffing in outrage, but forced by good manners to wait for his host to acknowledge his presence. Gideon let him wait. Miss Merridew was still clutching his arm—unconsciously, he suspected, though he couldn’t be sure. He waited for Great-uncle Oswald to become aware of it. It did not take long. “What shamelessness is this?” The old man’s face darkened, and his white brows gnashed fiercely together. “Unhand my great-niece, you unshaven lout!” roared Great-uncle Oswald. In the face of this barefaced provocation, Sir Oswald resumed his gobbling. “What the devil does my great-niece mean to you, sir?” he demanded. Aware that Miss Merridew was holding her breath anxiously, Gideon hesitated, then cast her a soulful look. “I cannot say,” he replied truthfully. After all, he knew almost nothing about her, except that her lips tasted delicious. He heard her exhale in relief and smiled to himself. Did the girl really think he would denounce her? When he was having so much fun? “I could deny it, I suppose, but I doubt you would believe me.” He sighed plaintively. Gideon stared at Prudence in shock. “You cannot be only sixteen! I do not believe it! You look, er, much more mature—” His eyes dropped to the evidence of her maturity. “Four and a half years ago?” Gideon repeated blankly. “Poisonin’ your innards with brandy? At this hour of the morning? Disgraceful!” Sir Oswald turned puce. “No! Not at all,” Prudence snapped in exasperation. The interview was not going at all as she had planned it. She should have taken control of the conversation much earlier, only her brain seemed to have seized up for a moment after that kiss. Several moments, in fact. Instead of concentrating on the matter at hand, her wretched mind kept sliding back to relive that scandalous kiss. Even her lips still seemed to tingle from it. “I was shy,” said six foot one of bashful male.